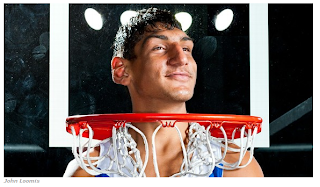 cryptonaut-in-exile: Reaching for play on words, I could only come up with "Diaper Ghandi" and "Hoop Singhs"
Reaching for play on words, I could only come up with "Diaper Ghandi" and "Hoop Singhs"
So where, we wonder, does the fairy tale of Satnam Singh Bhamara end? With an NBA debut, dozens of Bollywood stars in the stands and a hundred million Indians waking up before dawn to watch the game on TV? Or might the kid just fade away, the guileless victim of other people's projections and wishful thinking?